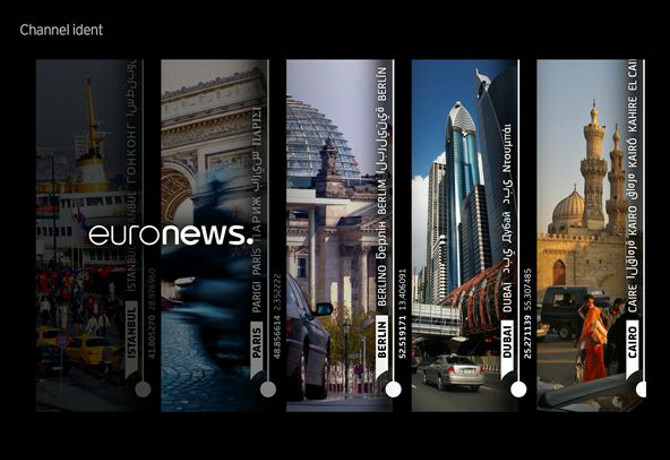 International independent news channel Euronews has received a modern revamp from brand agency Lambie-Nairn, which will roll out on 17 May. Lambie-Nairn was briefed to create a contemporary, dynamic look and feel for the most-watched news channel in Europe. This could be scaled across all regions, where six hundred journalists cover more than 35 countries and 13 editions, to highlight and celebrate the channel’s difference from competitors. The new logo and colour palette are designed to maximise legibility and recognition, whilst maintaining the pure circle element of the previous logo. Building on this, the agency built idents, news openers, bespoke magazine identities, a promo tool kit and ad bumpers, whilst collaborating with composer David Lowe to develop the channel’s audio identity. Euronews broadcast and programme marketing director Grégory Samak felt that the brand concept clearly demonstrates its understanding of the report and the need to update the channel to reach new audiences. ”It has delivered a dynamic identity that will help Euronews maintain its position as the most-viewed news channel in Europe,” he added.